To launch the MG-TF we pursued a strategy of 'Escape Routes' - essentially trying to get across ideas of escape and freedom. To get this across in newspapers we ran 'floating' ads. This was very difficult to negotiate and final execution varied. 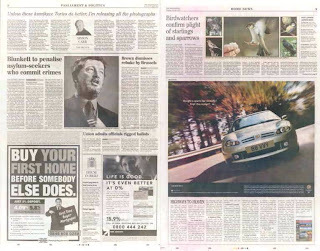 Some titles would only 'float' the ads in the centre of the centre spread, but not on a page. Other titles would only run on a page and not on a spread. The editorial beneath the ad is mocked up / fake editorial, but the overall impression is great!